Government-backed Islamic financing, a world-first in trade support developed by UK Export Finance, widens options for buyers of UK exports. When Emirates wanted to use Islamic finance to fund its purchase of four new Airbus A380s for its fleet, UK Export Finance (UKEF) developed an innovative guarantee for a sharia-compliant sukuk (Islamic bond) in the debt capital markets. The case was hailed as a new gold standard for sharia-compliant asset finance. It widens the options for buyers of UK exports and boosts the UK’s aspiration to become the leading Western hub for Islamic finance. This success reaffirms UKEF as the thought leader among European ECAs and once again shows UKEF’s remarkable ability to innovate in the face of changing market needs. 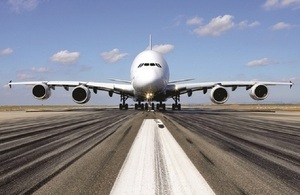 Financing the sale of large passenger aircraft such as the Airbus A380 poses ever-shifting challenges. Buyers typically require large loans with long repayment terms. Manufacturers require certainty that they will be paid. And the banks asked to arrange the finance do not always have the risk capacity to square this circle, and may turn to export credit agencies such as UKEF to provide a payment guarantee. Nearly a third by value of an Airbus 380 carrying Rolls-Royce engines is made in the UK. Therefore UKEF was keen to help, as more than 3,000 companies in the supply chain stood to benefit. The UKEF guarantee was applied to the issue of US$913 million of trust certificates sold in compliance with the requirements of Islamic scholars. The financing was used to buy four Airbus A380 aircraft, and UKEF can potentially now offer its new product to other overseas buyers of UK exports.